PRTG comes with all the features you need, plus more your IT infrastructure won’t want to live without. PRTG comes with 10 built-in technologies such as email, push, play alarm audio files, or triggering HTTP requests. PRTG on-premises also supports SMS text messages and executing EXE files. Our free push notifications help you stay up to date when using your mobile device(s). Adapt the notification system to suit your needs and schedule alerts (such as ‘no low priority alerts at night’), or avoid alarm floods by using dependencies and acknowledging. You could even use our PRTG API to write your own notifications. All user interfaces allow SSL-secured local and remote access and can be used simultaneously. It is always better to be safe than sorry. PRTG Network Monitor allows failover tolerant monitoring. One single failover is included in every PRTG on-premises license! Automatic failover handling: if the primary master of the cluster is not connected or is down, another node immediately takes over all its responsibilities, including the sending of notifications. Take advantage of multiple points of presence monitoring: all nodes monitor all sensors all the time, so you can compare response times from different locations in the network (LAN/WAN/VPN). The hosted version of PRTG also comes with high-availability monitoring. We take care of it for you so there is no cluster support in the cloud. Create dashboards with the PRTG map designer and integrate all your network components with more than 300 different map objects – from device and status icons to traffic charts and top lists. Individualize your map using custom HTML. 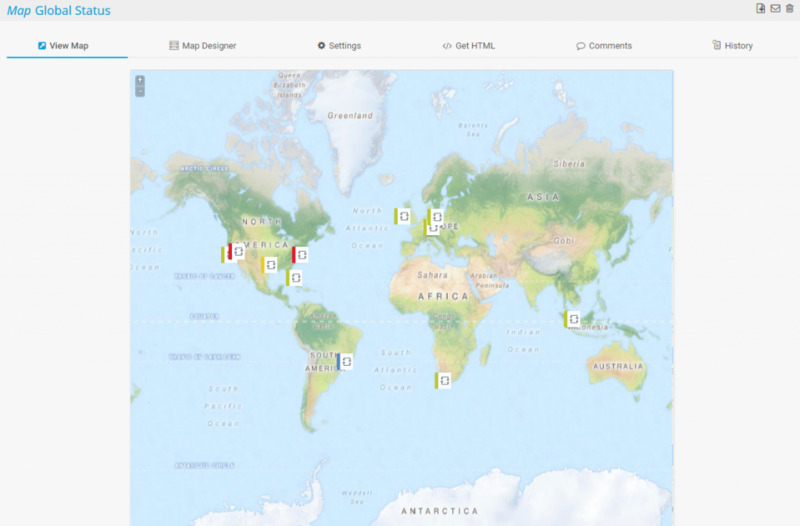 Share your map providing its unique URL on a dashboard within your company LAN only, or even outside your company. Monitor several networks in different locations and separated networks within your company (for example, DMZ and LAN) with PRTG Remote Probes. Use remote probes to monitor your LAN with the hosted version of PRTG. Get the overview in one central PRTG core installation. You can also use remote probes to distribute monitoring load. Each PRTG license includes unlimited remote probes. As MSP you can monitor your customer’s networks and increase the quality of service. 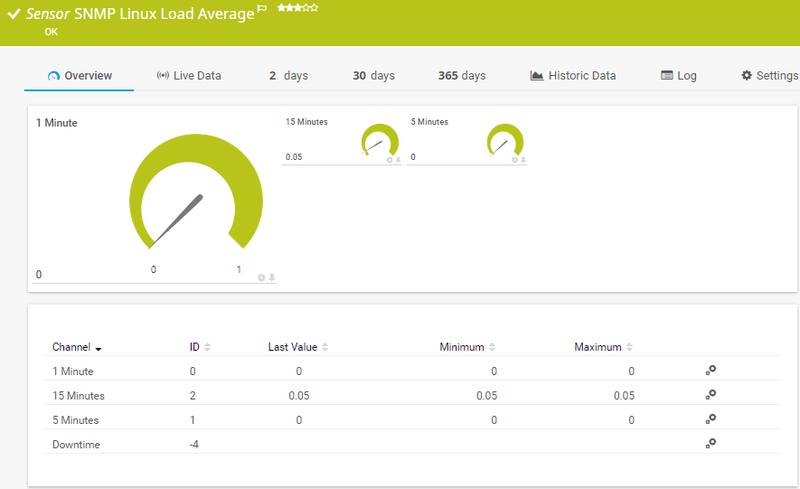 Get the numbers, statistics, and graphs of your specific monitoring data or configuration. Export your historic monitoring data as PDF, HTML, XML, or CSV files and further process your monitoring data. Run reports on demand or schedule regular reports (daily, weekly, monthly). Bandwidth is measured as the amount of data that can be transferred from one point to another within a network in a specific amount of time. Typically, bandwidth is expressed as a bitrate and measured in bits per second (bps). It refers to the transmission capacity of a connection and is an important factor when determining the quality and speed of a network. 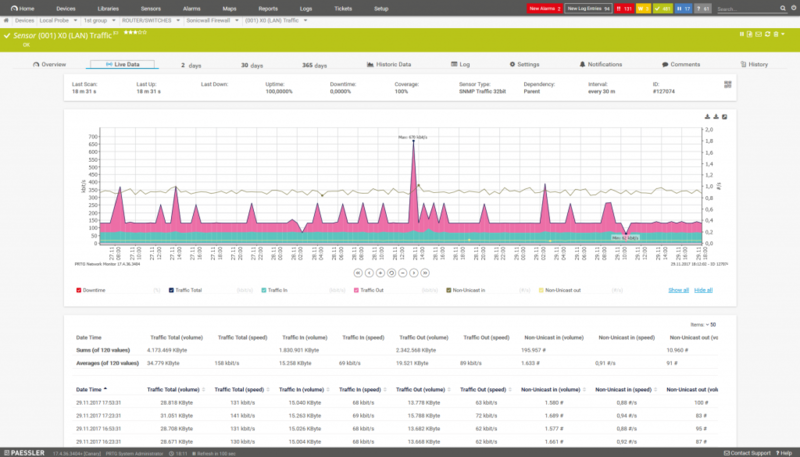 In this instance, PRTG bandwidth monitoring tool will help you to monitor bandwidth, detect and measure heavy bandwidth overloads, quickly recognize potential disruptions – and get down to the root of the problem. Practically every company sends large files. These files consume a correspondingly high amount of bandwidth. But bottlenecks lurking in every network slow down transfers. With PRTG, you’ll be able to promptly identify potential bandwidth overloads and quickly pinpoint the causes of crashes. 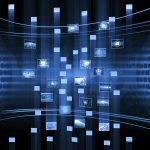 One single network component overloading can swiftly result in a significant loss of bandwidth. In PRTG, “Sensors” are the basic monitoring elements. One sensor usually monitors one measured value in your network, e.g. the traffic of a switch port, the CPU load of a server, the free space of a disk drive. On average you need about 5-10 sensors per device or one sensor per switch port. Custom alerts notify you about bandwidth shortages via SMS, email, or push notifications. This ensures you can react proactively to all bandwidth issues and troubleshoot problems before they become severe. Let PRTG test and measure your network bandwidth around the clock so you can concentrate on day-to-day tasks with total peace of mind. 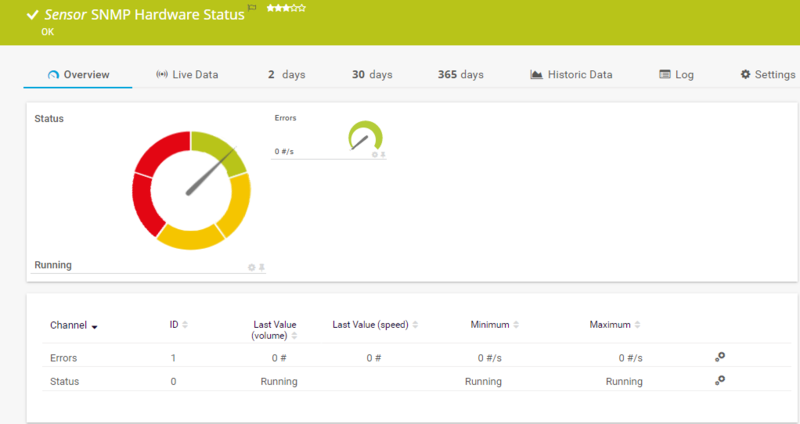 Your cloud status at a glance : PRTG can be started within minutes and it’s compatible with many mobile devices. With PRTG, you get a professional, central monitoring tool for all of your cloud computing services. Thanks to our dashboard and app, you’ll enjoy quick and comprehensive overviews any time. Database availability and database performance are vital elements to your business’s operations. PRTG queries data from your database without lengthy query, connection, or return times. 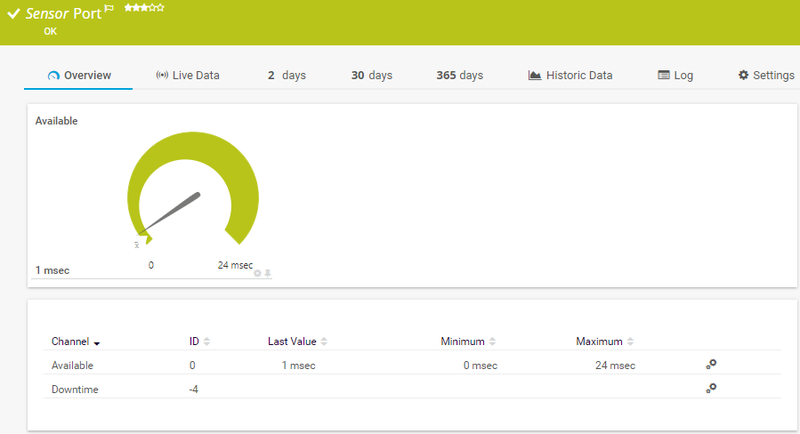 The execution time of the entire database request is displayed on your PRTG dashboard at all times. Monitor specific datasets from your databases, like no other database monitoring tools do, with individually-configured PRTG sensors and SQL queries that you define yourself. These datasets may come from the ticket database or online shop (see examples). Such database monitoring will enable you to optimize your business procedures and provide employees with important information. 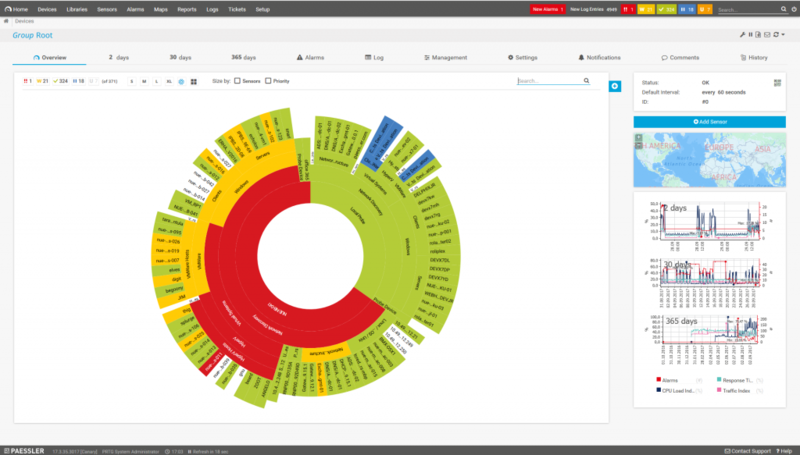 Would you like to use PRTG to analyze and monitor specific datasets in your databases? Then combine your database monitor with customizable reports which you can have sent to your managers automatically. With PRTG, all reporting features are included! PRTG offers predefined sensors for every important database manufacturer. Among them: MySQL, Microsoft SQL v2, Oracle SQL v2, and PostgreSQL. If you use a database that is not listed here, you can often run our ADO SQL v2 Sensor. Not enough? Write your own custom sensor easily. Thanks to the PRTG dashboard, you’ll enjoy an overview of all your databases – and much more, if you so choose. 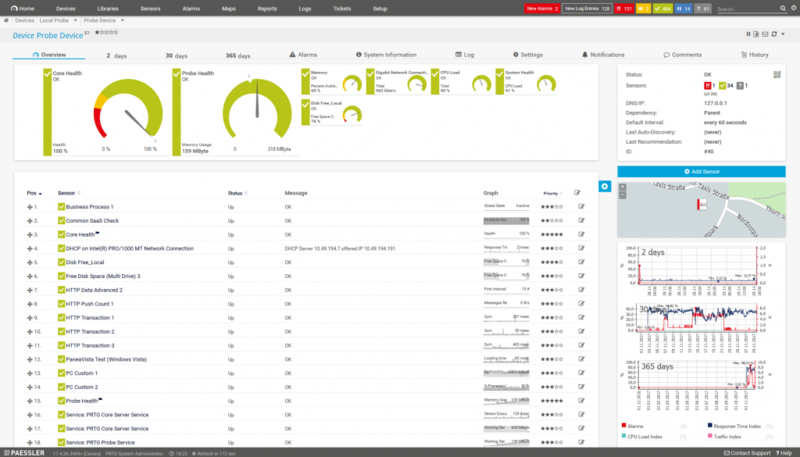 With PRTG, you can monitor your entire network. This is smart, for if your databases are acting up, the problem may ultimately lie elsewhere. Many companies uses ticket databases for outstanding work orders. Paessler also uses a ticket database, e.g. for its customer support. If this database contains too many unprocessed tickets, PRTG will automatically sound the alarm. When the sensor switches to red, you’ll know at once that additional staff is required. With PRTG, you can track your stock. When your online shop is booming, your warehouse often takes a heavy hit. PRTG will promptly notify those in charge so they can deal with the situation quickly. How much does your company make per hour, per day, per week? Use PRTG to display these figures on a screen in the office where everyone can see them. Further stats, such as the number of visitors to your website, are also part of the overview. Monitoring the ports in your network is always beneficial in terms of bandwidth usage and security. Since all data packets travelling through a network are sent and received via a port, port monitoring reveals the actual data traffic and bandwidth usage in your network. A suitable port monitoring tool offers bandwidth monitoring technologies like SNMP, Flows (NetFlow, IPFIX, sFlow, jFlow), Packet Sniffing, and/or WMI, and provides detailed statistics for bandwidth planning. Moreover, it helps you watch ports’ states to identify potential security risks caused by (accidentally) open ports. NetFlow is a protocol for collecting, aggregating and recording traffic flow data in a network. 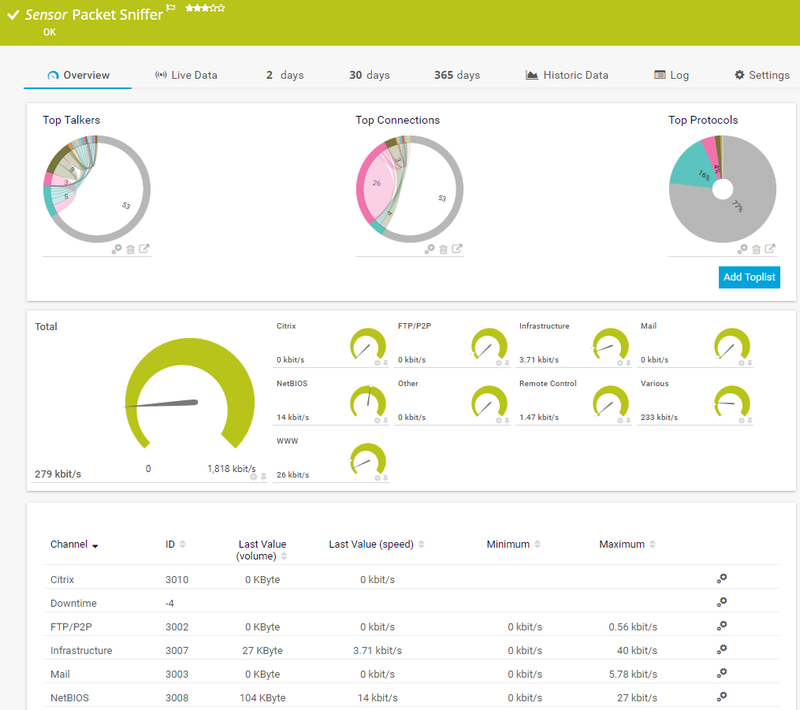 NetFlow data provide a more granular view of how bandwidth and network traffic are being used than other monitoring solutions, such as SNMP. NetFlow was developed by Cisco and is embedded in Cisco’s IOS software on the company’s routers and switches and has been supported on almost all Cisco devices since the 11.1 train of Cisco IOS Software. PRTG needs certain ports to function properly. As an administrator, you will have to free up these ports. You will find an initial overview below. PRTG monitors ALL your servers. 24/7. At a glance. Servers are the backbone of your business. To minimize downtime and to ensure peak performance of your website and services, constant monitoring of your server infrastructure and your data center is vital. By tracking the uptime, health, disk space and performance of your servers, you can prevent outages and identify bandwidth hogs. In addition, you are laying the foundation for delivering a great service to your customers, through a fast-loading and constantly available website. 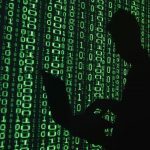 A server is a computer or system that provides resources, data, services, or programs to other computers, known as clients, over a network. In theory, whenever computers share resources with client machines they are considered servers. There are many types of servers, including web servers, mail servers, and virtual servers. Whether just a few servers or a large server farm: PRTG adapts dynamically to the size of your server landscape. And should you acquire more servers, all licenses are individually upgradeable. PRTG is an integrated solution: whether processors, memory, cooling fans, power supplies, or other components, our Server Monitoring Tool simultaneously monitors your servers as well as your entire infrastructure. PRTG immediately recognizes if a router or switch fails and causes a disruption in the server. 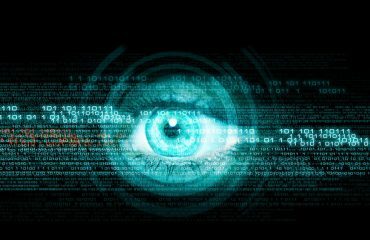 Even virtual servers are recognized automatically and included in the monitoring. Servers are the main elements of every IT infrastructure. Without them, a company is more or less unable to function. PRTG ensures system failures are as short-lived as possible – or even prevented in advance! Thanks to the e-mail or SMS alert feature, you’ll know straight away if complications arise. Locate errors directly: this will save you lots of time. You can even define the alert threshold values yourself. This means you’ll be notified before a shortage leads to a crash. PRTG helps out with your capacity planning. Our Server Monitoring Tool lets you to promptly recognize when in the medium to long-term it will be necessary to increase your capacities. Our dashboard presents compelling charts which are perfect for convincing your higher-ups with no technical know-how to expand your resources. The tool also features detailed reports providing a basis for scheduling and continual process optimization. Mail servers, in particular, are sensitive issues for companies. When mail server glitches occur, employees are quick to complain, putting the support department under intense strain. With PRTG, you can monitor your mail servers permanently and be alerted in a timely fashion. IMAP, POP3, SMTP, and many more: we supply more than a dozen sensors for your mail server monitoring. Website performance is a deciding factor for many companies – all the more so when they offer products and services via their websites. Downtime is costly, right from the very first second. That’s why PRTG also makes a whole range of sensors available for your web server monitoring(IIS, Apache, and more). Practically all company information is stored in databases. When it comes to databases, performance is also the basis for the effective functioning of each and every department. PRTG thus offers a variety of sensors which are available for immediate use. These include sensors for the monitoring of MySQL, Microsoft SQL, and Oracle SQL. You can selectively choose HTTP content or perform database queries. If firms can’t access information, then nothing works. One of the tasks of administrators is therefore to ensure the file server runs smoothly, and as with other servers, avoid crashes. It’s not uncommon for administrators to search, say, for a specific FTP server monitoring tool. But PRTG has you fully covered in this area as well. For you get around 20 sensors just for your file server monitoring. Monitoring of NAS devices and storage area networks (SAN) is also supported by PRTG. 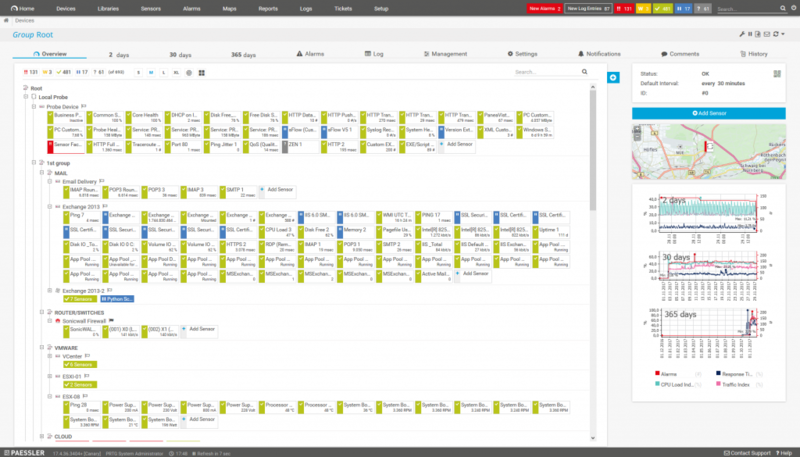 With PRTG, you get a number of other predefined sensors which provide an overview of your entire server landscape in no time at all. You can create your own sensors whenever you want, and use the API to adapt PRTG to absolutely any special situation. 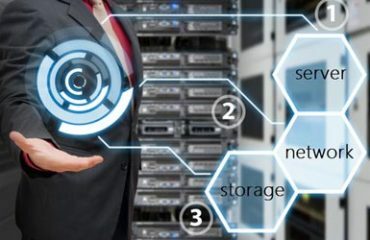 SNMP stands for Simple Network Management Protocol and consists of three key components: managed devices, agents, and network-management systems (NMSs). The protocol is a set of standards for communication with devices in a TCP/IP network. SNMP monitoring is useful for anyone who is responsible for servers and network devices such as hosts, routers, hubs and switches. 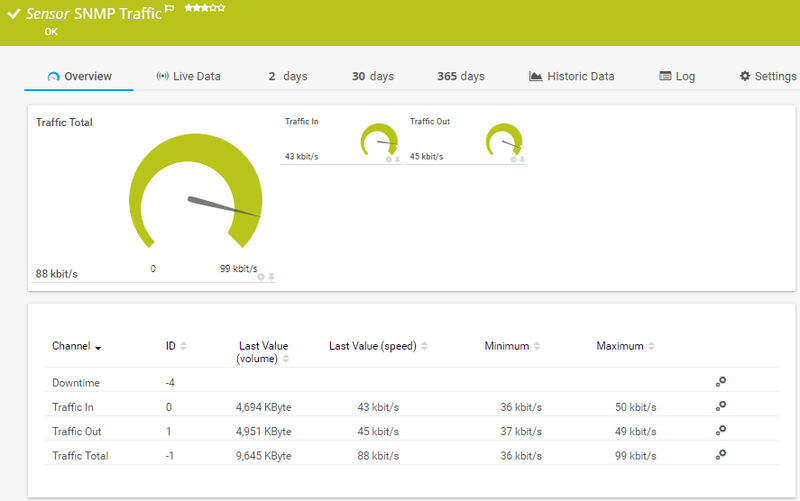 It lets you keep an eye on network and bandwidth usage, and track important issues such as uptime and traffic levels. PRTG comes with several preconfigured SNMP sensors. Among these is a series of sensors developed especially for device manufacturers such as Cisco, HP, Dell, and Synology. The SNMP Custom Sensor also lets you monitor a number of other devices from a variety of different manufacturers via SNMP. Below you will find a selection of our “best-of” sensors. Whether servers, routers, or switches: with PRTG, you get a professional SNMP network monitoring software and a comprehensive view of your network. 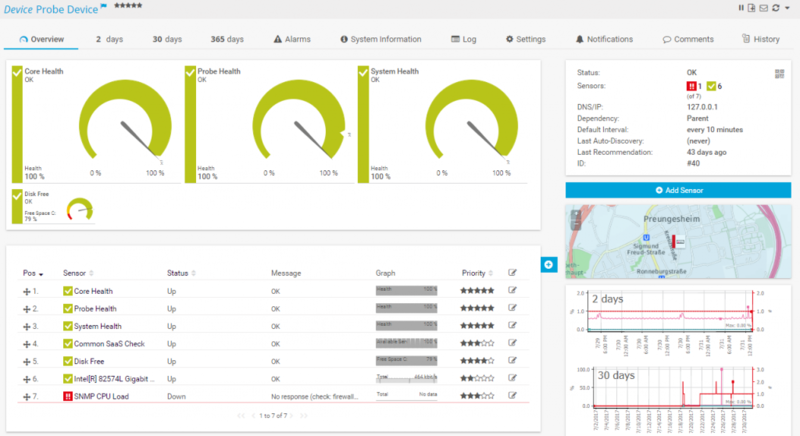 Our SNMP server monitoring software is equipped with a built-in alarm feature. You’re free to set the threshold values and alert method (email, SMS, or a free push notification to your smartphone) any way you please. PRTG includes a customizable notification system which you can define according to your own personal needs. The PRTG Auto Discovery facilitates your search. With this feature, all of the available devices in your network which are switched on for SNMP monitoring are checked, and suitable sensors are created, automatically. Your initial monitoring will thus be set up in the blink of an eye! You can then get down to its fine-tuning. Reports are also included in the free SNMP server monitoring software. Among other things, they feature clear and comprehensible charts. One of the times these reports can come in handy is when your hardware is under heavy strain and you need to convince your higher-ups to provide you with the funds for an upgrade. In general, network monitoring with SNMP is extremely reliable. PRTG offers many sensors adapted to the various versions (SNMP V1, SNMP V2c, and SNMP V3) and different manufacturers. SNMP monitoring requires a minimum amount of bandwidth. 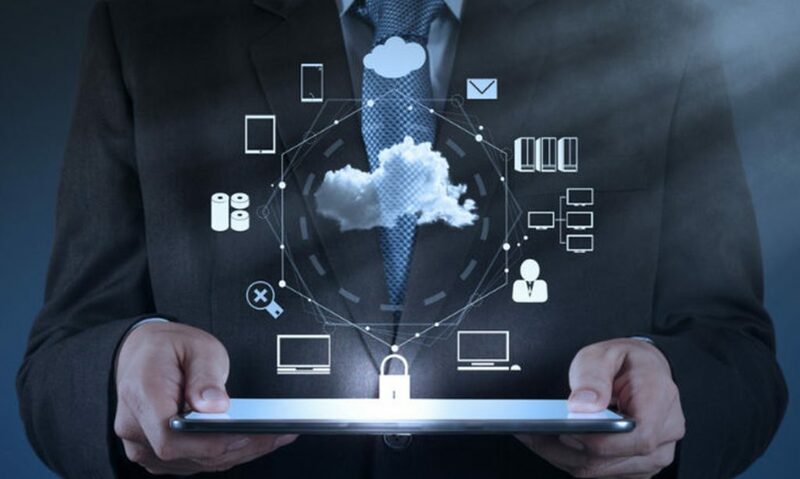 As an administrator, you therefore get the overview you need and the control that goes with it, without putting too much strain on your network. Like the bandwidth, the processor is barely affected. The CPU load of SNMP V1 and V2c is nearly imperceptible, even with broader monitoring including several thousand sensors. 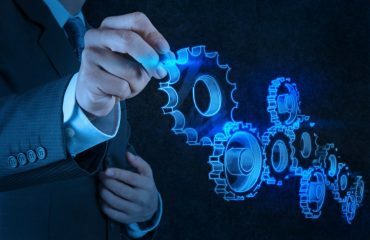 Almost all of the major device manufacturers (including Cisco, Dell, and HP) offer the Simple Network Management Protocol. For many devices, it is the only protocol used to read values. SNMP is a platform-independent standard. Activate the SNMP service in your Windows computer or configure the SNMP daemon in Linux. SNMP is also available for macOS. You can therefore incorporate all your computers into the holistic SNMP management software PRTG. PRTG is an easy and intuitive SNMP server monitor. You get one central monitoring tool with which to monitor your network via SNMP and SNMP traps. 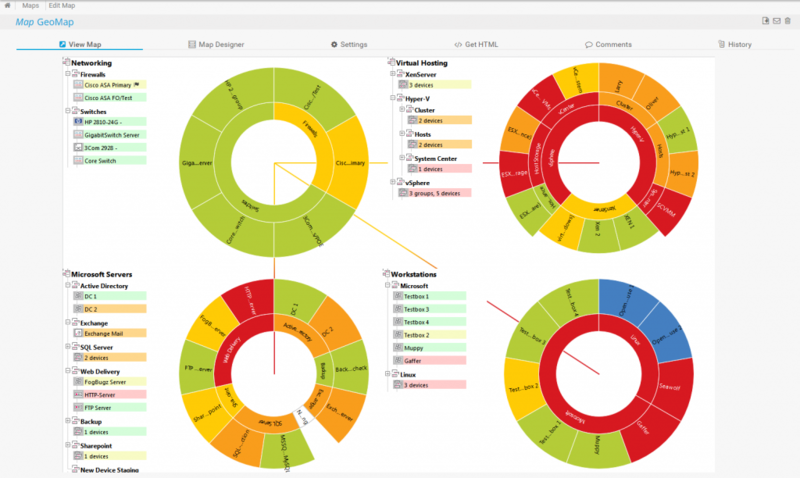 The dashboard provides a quick overview at all times – whether on your desktop or as an app.